Crashing oil prices might be a bit of good news for the struggling Japanese economy. Following OPEC’s decision on Thursday to not cut production, oil prices broke $US70 per barrel for the first time since June 2010. Some think it can drop as low as $US60 per barrel. 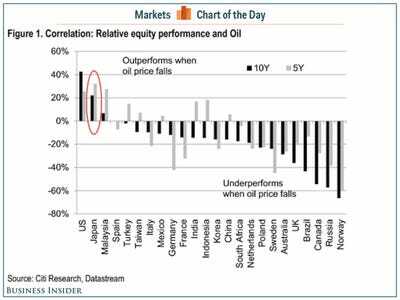 And while the drop in oil prices caused many oil company stocks to drop on Friday — and has hurt countries dependent on energy like Russia — Japan could potentially be a beneficiary. Already, Japan’s economy has seen a positive effect from the decline in oil prices, but the continued drop could be good news for both Japanese stocks and the Japanese consumer. “Japan benefits from lower oil prices as it’s a big importer,” writes Citi’s Robert Buckland in a recent note to clients. A welcome benefit, as Japan’s economy unexpectedly slipped into recession during the third quarter, as growth contracted at an annualized pace of 1.6% in the quarter. 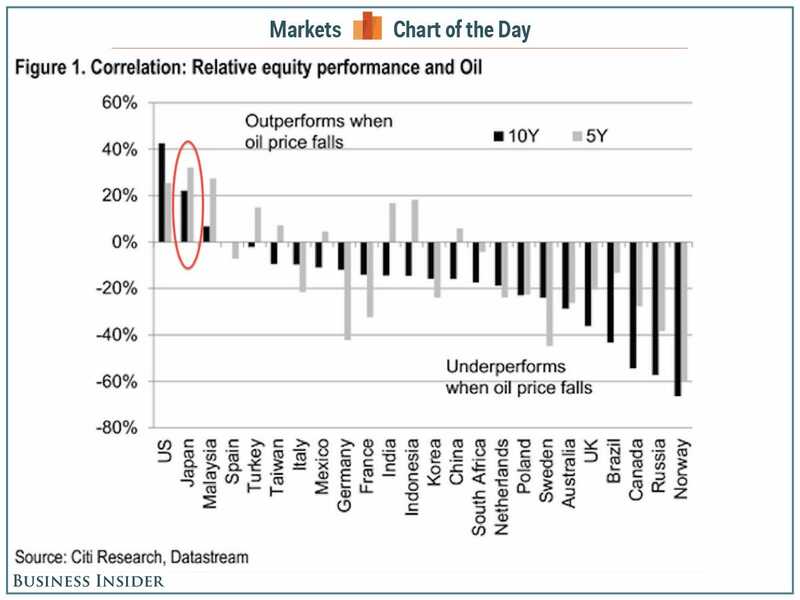 And in addition to the consumer gains, Japanese equities outperform by approximately 30% on a relative basis over a five year period, and by slightly more than 20% over a ten year period, following oil price declines.